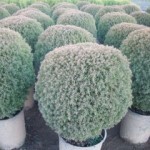 A dwarf globe shrub with soft bright green juvenile foliage. It has a bronze tone in the winter. Regular pruning in early summer keeps it looking its best. Ideal for small gardens, rock gardens or containers. 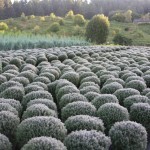 It prefers full sun or light shade in a moist, well-drained soil. Avoid a dry site.